Most building owners carry flood and fire insurance. However a commonly overlooked problem is lightning. Though the chances of being struck by lightning seem relatively small, there are over one billion in insured losses each year directly linked to lightning strikes. Lightning is not deterred by surge suppressors or by whole building protectors. Contrary to what most people believe, surge suppressors cannot protect a building against a direct strike. While these devices are an important component of a complete system to protect incoming utility lines against infiltration, they will do little to protect a structure from lightning. Lightning rods do not attract lightning. A lightning protection system reroutes a lightning strike and provides a safe path to the ground for discharging the electricity. Tall trees do not protect a structure from lightning. The problem with a structure located under a group of trees is that the best ground path for lightning may be the structure itself. Metal grounding systems within a structure may provide the best grounding path. Therefore lightning may side flash from the trees to the structure as it seeks a more conductive path to the ground. A lightning protection system is an essential element in protecting structures. 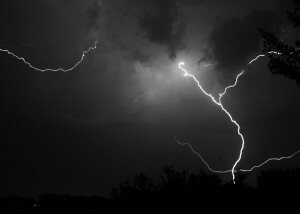 The system provides a low resistance path to intercept lightning’s dangerous electricity and directing it to the ground. This limits the impact to structures and its occupants. Installation and maintenance of lightning protection systems must be done by professionals who are knowledgeable of the NFPA and UL standards which affect lightning protection. If installed improperly or poorly maintained serious consequences may result and may be worse than having no protection at all. Over the last few years all new buildings on campus have included lightning protection systems. In 2012, The University funded two positions to be charged with the responsibility of inspecting and maintaining lightning protection systems on campus. Both are members of the Lightning Protection Institute (LPI). Ross Nichols is a certified Journryman Installer. Ross is an active member of the Lightning Protection Institute (LPI). He attends professional meetings and training regarding lightning protection and fall prevention. If you have questions or need additional information, contact EHS at 348-5905.